New Leeds United captain Liam Bridcutt has expressed his delight at becoming the new captain at Elland Road. The Scotland international replaces former centre back Sol Bamba who left the club by mutual consent last week. 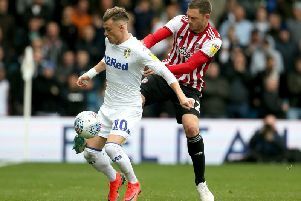 The former Sunderland and Brighton midfielder has made 29 appearances since initially moving to Elland Road on loan from Sunderland in November 2015. He also went on to make his first appearance for Scotland for three years when he featured for Gordon Strachan’s side in their 1-0 home win against Denmark. Bridcutt eventually moved to the Whites permanently last month, signing a two-year deal which will keep him at Leeds until the end of the 2017-18 season. He said: “It puts a little bit more pressure on me but that’s something I like.